Masha’s first visit to the US was back in 2010 to represent Spain at the World DanceSport Federation Championship in New York. In 2011 she was invited to teach the Rising Dance Stars in Boston, Massachusetts. In 2001 with the support of her parents, Masha took the next step forward in her professional development and moved to Spain from Russia to master her dance techniques under the best European instructors. Since then, she has represented Spain in the World and European Cups as well as in numerous official championships around the world. She owes her success to training under the best instructors and coaches from London, New York, Barcelona and Moscow. In Spain she found her dance partner Nicolas Garcia and they went on to dance together for 10 years. Even performing in the Spanish edition of “Dancing With the Stars” (“Mira Quien Baila”). Having adopted Spain as her new home, she founded a dance school, TWIST Cbe Jesus along with Nicolas. 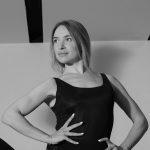 While pursuing her professional dance career, Masha also took on the responsibility of developing the next generation of rising ballroom stars by teaching in Spain, USA, Singapore and around the world. In 2016, Masha concluded her competitive DanceSport career and decided to dedicate her life to teaching and designing dance garments for competitions and practice sessions. In September 2018 she became an owner and director of Patricia’s Dance Lessons – now Maestro Dance Academy. She is eager to pass her knowledge of dance techniques onto those aspiring to develop their DanceSport skills or adopt dance as an art form for self-expression! As well as share her passion for the exquisite fashion and style of dancewear.